For other uses, see Mara. Mara (Sanskrit: māra; Chinese: 天魔; pinyin: Tiānmó; Tibetan Wylie: bdud; Khmer: មារ; Burmese: မာရ်နတ်; Thai: มาร; Sinhalese: මාරයා), in Buddhism, is the demon that tempted Gautama Buddha by trying to seduce him with the vision of beautiful women who, in various legends, are often said to be Mara's daughters. In Buddhist cosmology, Mara is associated with death, rebirth, and desire. Nyanaponika Thera has described Mara as "the personification of the forces antagonistic to enlightenment." The word "Māra" comes from the Proto-Indo-European root *mer meaning to die. The Sanskrit form of the verbal root is √mṛ. It takes a present indicative form mṛyate and a causative form mārayati (with strengthening of the root vowel from ṛ to ār). Māra is a verbal noun from the causative root and means 'causing death' or 'killing'. It is related to other words for death from the same root, such as: maraṇa and mṛtyu. The latter is a name for death personified and is sometimes identified with Yama. Kleśa-māra, or Ma̋ra as the embodiment of all unskillful emotions, such as greed, hate and delusion. Mṛtyu-māra, or Māra as death. Skandha-māra, or Māra as metaphor for the entirety of conditioned existence. Devaputra-māra, the deva of the sensuous realm, who tries to prevent Gautama Buddha from attaining liberation from the cycle of rebirth on the night of the Buddha´s enlightenment. Early Buddhism acknowledged both a literal and psychological interpretation of Mara. 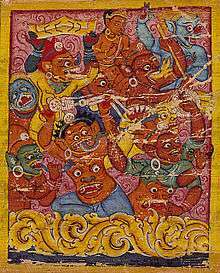 Specially Mara is described both as an entity having an existence in Kāma-world, just as are shown existing around the Buddha, and also is described in paṭiccasamuppāda as, primarily, the guardian of passion and the catalyst for lust, hesitation and fear that obstructs meditation among Buddhists. "Buddha defying Mara" is a common pose of Buddha sculptures. The Buddha is shown with his left hand in his lap, palm facing upwards and his right hand on his right knee. The fingers of his right hand touch the earth, to call the earth as his witness for defying Mara and achieving enlightenment. This posture is also referred to as the 'earth-touching' mudra. Some stories refer to the existence of Five Daughters, who represent not only the Three Poisons of Attraction, Aversion, and Delusion, but also include the daughters Pride, and Fear. ↑ See, for instance, SN 4.25, entitled, "Māra's Daughters" (Bodhi, 2000, pp. 217-20), as well as Sn 835 (Saddhatissa, 1998, page 98). In each of these texts, Mara's daughters (Māradhītā) are personified by sensual Craving (taṇhā), Aversion (arati) and Passion (rāga). ↑ Trainor, Kevin (2004). Buddhism: The Illustrated Guide. Oxford University Press. p. 34. ISBN 9780195173987. ↑ Thera, Nyanaponika (2008). The Roots of Good and Evil: Buddhist Texts translated from the Pali with Comments and Introduction. Buddhist Publication Society. p. 22. ISBN 9789552403163. 1 2 Olson, Carl (2005). The Different Paths of Buddhism: A Narrative-Historical Introduction. Rutgers University Press. p. 28. ISBN 9780813537788. ↑ Buswell, Robert Jr; Lopez, Donald S. Jr., eds. (2013). Princeton Dictionary of Buddhism. Princeton, NJ: Princeton University Press. pp. 530–531, 550, 829. ISBN 9780691157863. ↑ Williams, Paul (2005). Buddhism: The early Buddhist schools and doctrinal history ; Theravāda doctrine, Volume 2. Taylor & Francis. pp. 105–106. ISBN 9780415332286. ↑ Keown, Damien (2009). Buddhism. Sterling Publishing Company. p. 69. ISBN 9781402768835. ↑ Vogel, Jean Philippe; Barnouw, Adriaan Jacob (1936). Buddhist Art in India, Ceylon, and Java. Asian Educational Services. pp. 70–71. ↑ Keown, Damien (2004). A Dictionary of Buddhism. Oxford University Press. p. 174. ISBN 9780191579172. ↑ See, e.g., SN 4.25 (Bodhi, 2000, pp. 217-20), and Sn 835 (Saddhatissa, 1998, p. 98). In a similar fashion, in Sn 436 (Saddhatissa, 1998, p. 48), taṇhā is personified as one of Death's four armies (senā) along with desire (kāmā), aversion (arati) and hunger-thirst (khuppipāsā). ↑ SN 4.25, v. 518 (Bodhi, 2000, p. 220). Saddhatissa, H. (translator) (1998). The Sutta-Nipāta. London: RoutledgeCurzon Press. ISBN 0-7007-0181-8. Guruge, Ananda W.P. (1991). "The Buddha's encounters with Mara, the Tempter: their representation in Literature and Art" (PDF). Indologica Taurinensia. 17-18: 183–208. Archived from the original (PDF) on November 22, 2014.